Here’s a very useful free seamless zipper textures pack download that is great for your Marvelous Designer 3D clothing. Included are open zippers and closed zippers of various colors as well as a black and white closed zipper texture that you can tint any color you wish. 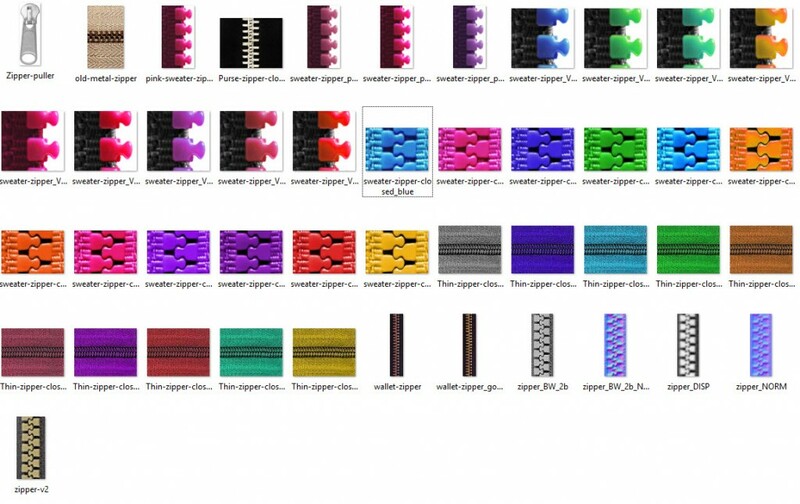 These tileable zipper textures are what we use for our own 3D dynamic clothing. You can use our free zipper textures for your VR, 2D or 3D shirts, hoodies & sweatshirts, for pockets, jackets & coats, pants, etc. 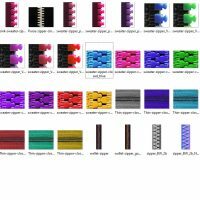 Use this free tiling zipper textures for Marvelous Designer garments, Daz studio, Poser, SL, iClone/Character Creator, Sansar, or other 3D clothes. After you download our zipper texture, apply it as a fabric texture to create a zipper effect in Marvelous Designer. Use the texture transform tool to scale the texture up or down to make it fit your clothes. To make the zipper look even more realistic, apply a zipper normal map either in Marvelous Designer or later when you render your 3D clothes. Note: To keep the Marvelous Designer zipper strip from stretching or getting lumpy, I recommend you also apply one of our zipper physical property presets (or create your own stiff preset). Lastly, to complete the zipper for your 3D clothes render, add a zipper puller (either a zipper puller texture or a zipper 3D model). We’ve included in this free seamless zipper texture pack, a zipper puller texture (PNG image) that can be used for Marvelous Designer clothes animations. This is very useful if you don’t use another 3D program and don’t know how to attach 3D zipper models onto animated clothes in another program. In Marvelous Designer, there is currently no option to pin/ glue objects like a 3D zipper puller onto your Marvelous Designer clothes. For still renders using a 3D zipper model for your clothes is the best most realistic option. However, if you want to create animations in Marvelous Designer software it is impossible to attach a 3D zipper model on to your clothes (unless you export the animated clothing and attach a 3D zipper model in another program). So the second best option for animating Marvelous Designer clothing, is to ‘cheat’ and sew on a small pattern onto your zipper and apply our free zipper puller texture. 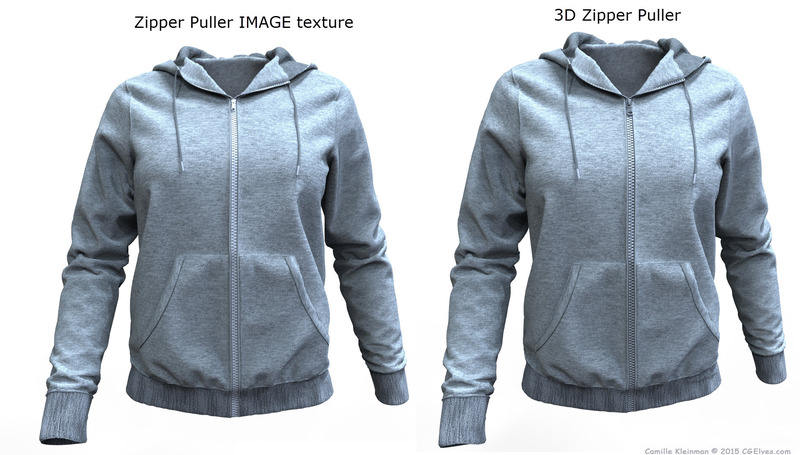 See here below a comparison of the same hoodie once with a real 3D zipper puller model and once with a texture of a zipper puller. Need a free 3D zipper puller OBJ model? Download a free zipper 3D model here. We hope our free seamless zipper textures help you!